MOSCOW (AP) — Protesters gathered across Russia on Sunday to support opposition leader Alexei Navalny’s call to boycott the March presidential election, and Navalny himself was arrested while walking to the Moscow demonstration. Many of the crowds that turned out in generally frigid weather skewed sharply young, apparently reflecting growing discontent among Russians who have lived most or all of their lives under President Vladimir Putin, who came to power on New Year’s Eve 1999. “As long as I’ve been alive, Putin has always been in. I’m tired of nothing being changed,” said 19-year-old Vlad Ivanov, one of about 1,500 protesters who assembled in St. Petersburg. Navalny, Putin’s most prominent foe, organized the protests to urge a boycott of Russia’s March 18 presidential election, in which Putin is sure to win a fourth term. He was wrestled to the ground and forced into a police bus as he walked toward the demonstration on Moscow’s Pushkin Square. The anti-corruption campaigner was denied permission to be a presidential candidate because of an embezzlement conviction in a case widely seen as politically motivated. Late Sunday night, hours after police detained him, Navalny said on Twitter that he had been released before a trial. 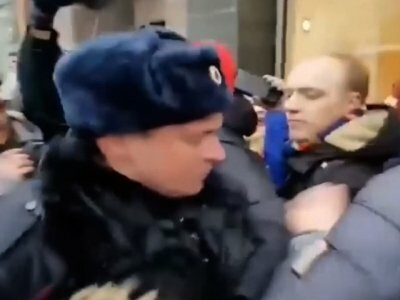 Russian news reports cited police earlier as saying he was likely to be charged with a public-order violation for calling unauthorized demonstrations. Independent radio station Ekho Moskvy reported after his release that Navalny had not yet been presented with a charge. No figures were available for how many people participated in the protests, but the turnout was clearly smaller than for rallies Navalny organized last year. The size and scope of the earlier protests, which took place in provincial cities regarded as the center of Putin’s support, rattled the Kremlin. Protests were reported in dozens of cities, from the Pacific Coast to the Baltic Sea exclave of Kaliningrad. Navalny’s web page showed a small group of protesters in remote Yakutsk, where it was minus 45 Celsius (minus 49 Fahrenheit). After that gathering dispersed, columns of protesters took off in several directions. One group skirted the Kremlin, then headed down the Novy Arbat, a prime shopping and entertainment area, and to the riverside government headquarters building informally called the Russian White House. Shouting “Putin is a thief,” some of the protesters threw handfuls of snow through the high spiked fence surrounding the building. Police did not interfere, a contrast to their typically quick and harsh responses to unauthorized gatherings. The OVD-Info organization, which monitors political repression, reported that 257 people were arrested in the demonstrations throughout the country. Hours before the Moscow protest, police raided Navalny’s headquarters, where there is a studio for live video transmissions. One broadcaster on the stream said police apparently were using a power grinder tool to try to get into the studio. The anchors hosting the feed reported that police said they had come because of an alleged bomb threat. One anchor, Dmitri Nizovtsev, was detained by police, according to video broadcast from the headquarters. Navalny’s Moscow coordinator, Nikolai Lyaskin, also was detained Sunday, the Interfax news agency quoted him as saying. Several hundred demonstrators assembled in the Pacific port city of Vladivostok, complaining both of Putin’s rule and of Navalny’s exclusion from the March 18 presidential election. “They took these elections away from us, they took away our votes. Our candidate was not allowed to run,” said Vladivostok demonstrator Dmitri Kutyaev. Navalny rose to prominence with detailed reports about corruption among top Russian officials, which he popularized on social media to circumvent state control of television.